Naval Air Station Lemoore or NAS Lemoore (IATA: NLC, ICAO: KNLC, FAA LID: NLC) is a United States Navy base, located in Kings County and Fresno County, California. Lemoore Station, California, a census-designated place, is located inside the base's borders. NAS Lemoore is the Navy's newest and largest Master Jet Base. Strike Fighter Wing Pacific, along with its associated squadrons, is home ported there. 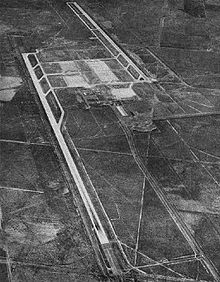 Commissioned in 1961, NAS Lemoore, as seen from an aircraft flying above, looks significant and stands out from the farmlands of Central California, due to its large construction. NAS Lemoore is the newest and largest Master Jet Base in the U.S. Navy. It has two offset parallel runways 4,600 feet (1,400 m) apart. Aircraft parking and maintenance hangars are aligned between the 13,500-foot (4,100 m) runways. Separated from the hangars by underpasses beneath taxiways A & C, the remainder of the air operations area is located directly southeast. In July 1998, NAS Lemoore was selected as the West Coast site for the Navy's newest strike-fighter aircraft, the F/A-18E/F Super Hornet. This action brought approximately 92 additional aircraft, 1,850 additional active duty personnel and 3,000 family members to NAS Lemoore and several associated facility additions or improvements. The Navy also brought four new fleet squadrons to Naval Air Station Lemoore over the period 2001-2004. Additional military staffing was required at Aircraft Intermediate Maintenance Department, Strike Fighter Weapons School Pacific, and the Center for Naval Aviation Technical Training Unit Lemoore (CNATTU Lemoore) to support this effort. Originally, the Officer In Charge of Construction for building the base was Commander Dennis K. Culp CEC/USN, who was the first Naval officer in Lemoore. On 31 March 2016, two civilians were killed when the Jeep Grand Cherokee they were driving in collided with a parked F-18 jet. At the time they were being pursued by the California Highway Patrol and managed to enter the base without hindrance by base security. A CHP helicopter was monitoring the chase from above and captured the event in a FLIR video; the base tower staff can be heard asking if the vehicle was already in the base. A CHP dispatcher can be heard confirming so and that CHP were unable to contact base security for assistance. With the transfer of NAS Miramar to the United States Marine Corps, NAS Lemoore now hosts the Navy's entire west coast fighter/attack capability. NAS Lemoore was built "from the ground up" as a Master Jet Base, and has several operational advantages, and relatively few constraints, as a result. Strike Fighter Wing Pacific with its supporting facilities is home ported here. The primary aircraft based at NAS Lemoore is the F/A-18 Hornet Strike Fighter. In November, 1999, NAS Lemoore received its first F/A-18 E/F Super Hornets, which replaced the F-14 Tomcat in fleet service as an air-superiority fighter and has assumed, in a different configuration, the role of older F/A-18 Strike Fighters. Currently, there are a total of 175 Hornets and Super Hornets home-based at NAS Lemoore operating from one Fleet Replacement [training] Squadron and sixteen Fleet [operational] Squadrons. In 2017, the F-35 Lightning II was received onboard NAS Lemoore, establishing the first F-35 Pacific training squadron. ^ "Naval Air Station Lemoore". www.cnic.navy.mil. ^ Peres, Jessica (2016-03-31). "CHP chase ends in fatal crash into a F/A-18 at NAS Lemoore". ABC30 Fresno. Retrieved 2018-10-08. "Naval Air Station Lemoore". Official web site. Retrieved 2008-10-11. "Naval Air Station Lemoore". GlobalSecurity.org. Retrieved 2006-10-30.